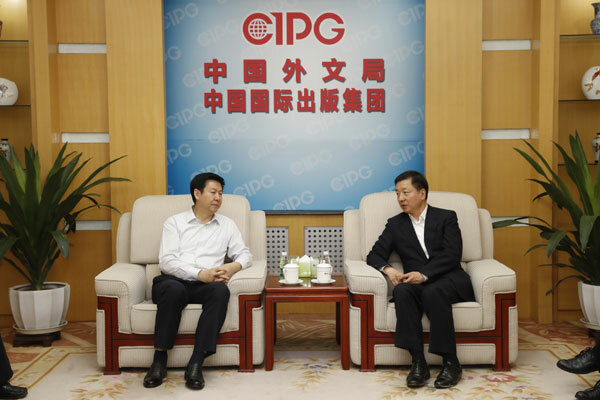 Zhou Mingwei (R), director of the organizing committee for APTIF8, President of Translation Association of China and President of the CIPG talks with Zhuang Changxing, President of the organizing committee and Vice Governor of Shaanxi Province in Beijing, on May 12, 2016. Members of the APTIF8 organizing committee met for the second session to discuss the current and future preparations for the forum on May 12 at the China International Publishing Group (CIPG) in Beijing. Members of the committee heard the report on the meeting's preparation, arranged the media publicity work and confirmed the guests' attendance. Zhou Mingwei, director of the organizing committee for APTIF8, President of Translation Association of China and President of the CIPG, said that the upcoming forum will be a highly internationalized and specialized meeting. 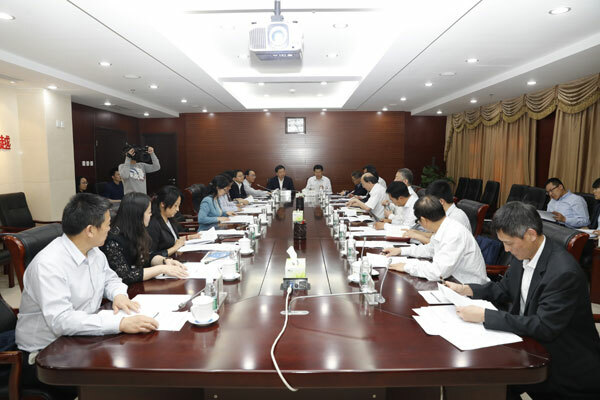 He praised the Shaanxi provincial government for its attention to the meeting's preliminary preparation and acknowledged its experience in holding activities of international exchange. Zhou also asked that all agencies across the CIPG fully cooperate with Shaanxi to ensure that the preparation for APTIF8 goes well, so that the APTIF8 can showcase the strength of China's translation society. Zhuang Changxing, President of the organizing committee and Vice Governor of Shaanxi Province, said that APTIF8 is of great significance in promoting the opening-up of the province. He stated that the preparation has been going smoothly and called on all provincial agencies to take more responsibilities and enhance cooperation so that the forum will take place in a satisfactory way. APTIF8 will be held in Xi'an, Shaanxi Province, on June 17-18. The meeting is expected to attract more than 400 people.